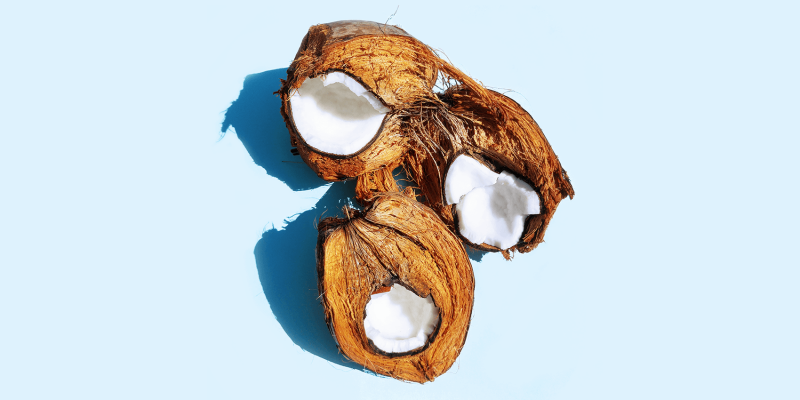 Coconut oil is such a great oil for your hair, that I dedicated a whole article to it. I discuss all of its benefits there and give tips on how to use it for healthy hair. Today I share one of my favorite DIY hair superstars: my homemade coconut oil argan oil hair mask. One of coconut oil’s most amazing properties is that it manages to penetrate deeper into your hair than other oils. It helps restore and reduce protein loss, which makes it especially good for damaged hair. Coconut oil helps your hair retain moisture, it stimulates new hair growth and strengthens the hair fibre. Its antimicrobial properties help protect your scalp and keep it healthy. Nowadays I make most of my beauty products myself. I love using natural ingredients that show great results. Another key ingredient in this amazing DIY coconut oil argan oil hair mask is argan oil. It’s a very rich oil native to the argan tree from Morocco. Argan oil is full with antioxidants, omega 6, vitamins A, C and E and linoleum acid. It moisturizes and protects your hair from external influences such as heat and chemicals. It also stimulates cell production, helps with hair loss and repairs your hair. By the way, i’s not just amazing for your hair, it provides tons of benefits for your skin as well. When I travelled to Morocco I bought some good quality, locally sourced Argan oil and I use it daily on my face. This hair mask also contains apple cider vinegar. It balances the hair’s pH level, improves blood circulation, has antimicrobial properties and stimulates hair growth. Lavender oil doesn’t just smell great, it also nourishes and relaxes your scalp, promotes hair growth and helps with blood circulation. This hair mask is an amazing combination of some of nature’s most powerful ingredients for your hair. Once it is fully melted, you can add the argan oil. 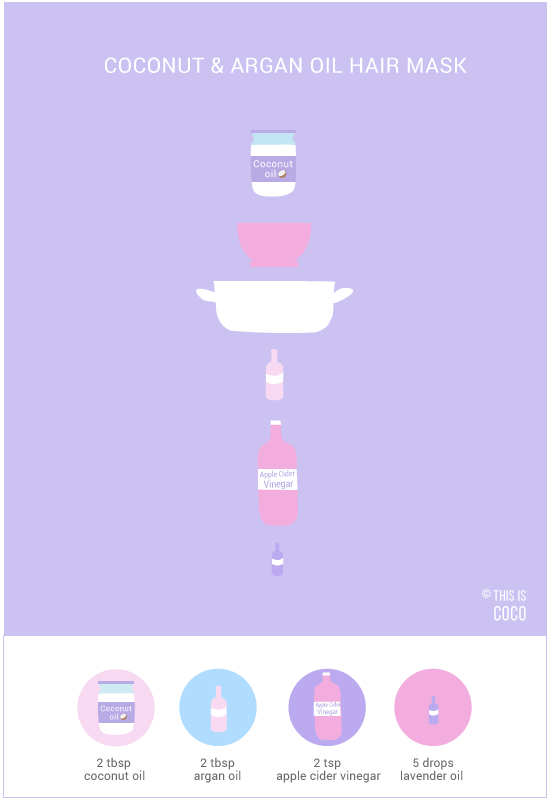 Add the other ingredients and mix everything. Apply the hair mask on clean hair, working from the roots to the ends. Leave the mask on for at least 30 minutes. Rinse well with warm water and a natural shampoo. You can easily use this DIY coconut oil argan oil hair mask once a week. If you’ve tried this mask, let me know how it worked for you! Come say hi and share your experience with the coco community on Instagram.